I hate that I am writing about post partum depression. I hate writing about it because before I had it, I honestly thought that some people were just not strong enough, or that they just couldn’t handle it and they should go for a walk and they would feel better. I grew up in the North East! We are a strong bunch! We don’t have time for “mental” problems. I remember talking to my parents when I thought it might be going on and them brushing it off and saying that I was “just tired”. I was also really, really, tired, that is true. To the point where I would cry for no reason, feel nauseus during the day and managed most days with a mild headache and a promise that “tonight just has to be better”. I believe part of what contributed to my post partum depression is my road to being a parent. It wasn’t easy for us to have a baby. This was my third pregnancy. The first pregnancy was lost to an early miscarriage that shook my confidence and introduced me to a world where it’s possible to have the excitement of a positive pregnancy test and that not result in a child some months later. The second pregnancy loss was shocking and heartbreaking to our family. After the miscarriage, my only concen was making it past 12 weeks, past the “danger zone”. Once I was 12 weeks pregnant I told friends and family and we celebrated together out at dinner. I was assured that in the Spring our guest room would be a baby room. I dared to buy one baby outfit, a soft pale yellow newborn onsie. I imagined it would be the "going home" outfit for our little one. Instead, at only 6 months pregnant, I gave birth to and lost a baby boy. It was a loss that broke my heart and made me feel like I was in this category of women that just can't carry a pregnancy that results in a child coming home. I was a reproduction loser. Friends and family around me were having children. I could mark my losses by their children’s birthdays. Attending those parties without my boy, and with no pregnancy to speak of exhausted me. I just wanted to have a baby, quietly, with no one noticing. I wanted to not have people tilt their head sideways and look at me with pity when they talked of my family. So when I got pregnant for the third time I kept it a secret. I didn’t tell anyone until three months. And then I only told my immediate family. Some of my closest friends didn’t know until I was 20 weeks pregnant. I told people at work only after an anatomy scan at 5 months revealed that the child was healthy as far as they could see. One of my favorite coworker's reaction was "Oh good. Your outfits were getting really weird." So when I made it to 38 weeks and my son arrived, I expected to feel so much relief from the sadness I had carried. I did feel some relief that he was here safely and that I could stare at him and know he was real, and coming home with us. I remember being in the delivery room feeling like I should some sort of uphoric moment that I was not having. Instead when they put me in a wheelchair and handed me my son to go to the recovery room, I fell asleep with him in my arms. I also felt overwhelmed, tired and struggled with feeling like things should be coming “naturally” that really weren’t. I was home with this little guy for the first three months on (unpaid) maternity leave. It was a drastic shift from working full time and feeling like an accomplished professional. We didn’t have the kind of day to day help that I had imagined and there were too many days where I didn’t talk to another adult for 8-10 hours. My husband went back to work a week after our son was born. While we both had parents we loved, they lived out of state, the closest being over two hours away. People came to visit but I felt so isolated and when they left I often felt more exhausted and really believed that no one understood what I was going through. I reached out for help at my six week post partum appointment. They did a screening test in the office and I “passed”. When the doctor came in to see me and I gathered everything in me to tell him I thought I might have post partum depression, he said “Yeah, that happens. It will go away soon”. But he was wrong. I didn’t really start to feel like myself until about nine months after having my son. And only then through a combination of exercise, sleep and therapy. The physician’s lack of support and unwillingness to help me address this depression made me feel like I should just handle it on my own, and that it wasn’t worth it to see if perhaps I could feel better than I did. I thought maybe that’s just how everyone felt post partum. I dreaded my son waking up, I was almost constantly mad at my husband and I felt like I had fallen into a hole and no one would understand or be helpful to me. I was almost unable to have any empathy for my son or anyone else. I loved him, but it was through gritted teeth, struggling just to get dressed and feel okay about the new world I was in. I have a new little one at home now. It’s been four months and I’ve been vigilant about waiting, watching to see if any signs of post partum depression will come back. I feel that down, terrible feeling very infrequently and usually when I am my most exhausted. Those around me reassure me that I am tired, and it’s not the same, and it will be okay. I asked them to do this for me, and also to get me help should it not be okay. 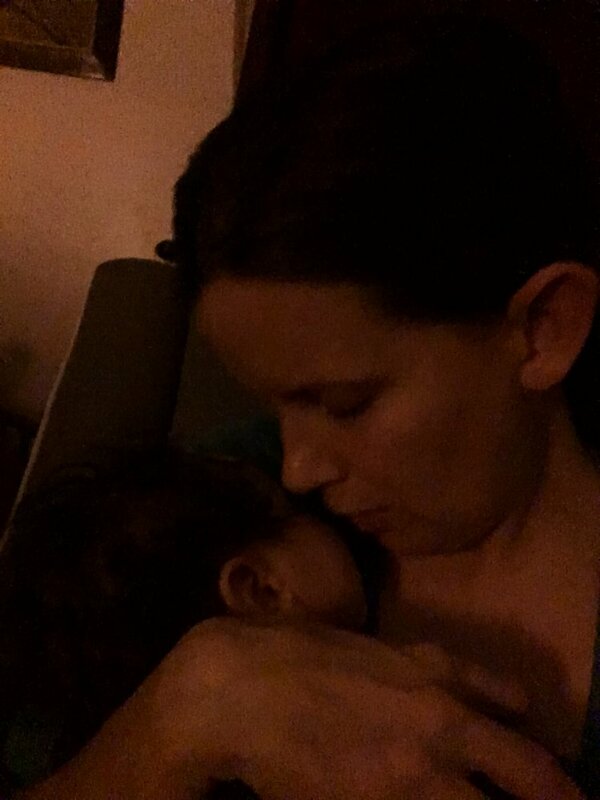 There are a lot of reasons why this time is different and I feel so lucky that the post partum depression fairy has given me a pass this time. There were also concrete things that I am trying to do differently this time. I made a list, because if you are tired and post partum, I’m impressed you even read this far and you deserve a list. Here is what I would have done differently if I could do it again. 1. For nursing Mamas, I would pump milk early on. I would start pumping around day four or five of life. I know this sounds crazy, but for me, it would have been worth it to have one stretch each day where I could have my partner feed the baby and I could sleep for 3 or 4 hours instead of 1 or 2. Not sleeping makes everyone feel terrible. That is a fact. 2. Speaking of milk, and this one is hard. I should have stopped nursing. It was making me miserable, I didn’t enjoy it and it was causing me to dread my son being awake because I was so nervous/scared about feeding him. I look back on this and really regret that I could have been just happily feeding him and enjoying his company instead of constantly calculating how much milk he had, if I had enough and how much time I had to eat/poop/take a walk before he needed to eat again. 3. I would put all of my friends and family on warning. I would tell them to come over, bring me food, send meals and tell me what days they would be free for me to stop by and have them hold the baby. 4. I would use my wonderful neighbors. I would drop the baby off to them and just go back in my house for ten minutes alone. I did this recently with my little guy, and the neighbor talked about it for weeks, and how much it meant to her to have special time with him. 5. I would go outside. Even in the cold/rain/dreary days. Everything is worse when you are stuck inside your house. I would bundle the baby up and take the bus downtown to get something good to eat. Then I would bus it back. 6. I would get a counselor before having the baby and make three appointments for after I had the baby. That way I would make sure that I already had someone established who I could go talk to. I would tell the counselor that I was worried about post partum depression so she would seek me out when I tried to cancel those appointments. And if that counselor recommended medication, I would take it! 7. I would deeply believe (still working on this one) that my body is capable of healing itself, getting back in shape and recovering but that I would need to give it time. Like 9 months of time, not three months. 8. I would stop cleaning/cooking and caring about those things. For real. I am not uniquely qualified to do those things. 9. I would write about it. Or find a blog where someone is writing about it and read it. I felt alone, like no one really got it. Even the few people that did try to pull me back up and help me deal with it, I knew they loved me but couldn't get past the thought that they were judging me, and that they didn't really understand. 10. I would forgive myself for having post partum depression. It has taken four years, a second child (where I didn’t have post partum depression) and a lot of counseling to realize that I felt really guilty and struggled with feeling like I wasn’t good enough, or strong enough. I am enough. You are enough.